Jessica Watkins, 37, of Butler walks a mile to and from work every day and relies on family and friends to go to the grocery store and other necessary places. On Saturday, the veteran and Butler resident received a refurbished 2013 Ford Explorer though the National Auto Body Council’s ‘Recyced Rides’ program. “Recycled Rides” is a community service program of the National Auto Body Council where body shops repair and donate recycled vehicles to families in need. Jessica was chosen as the recipient of this donation through the NABC and the Center for Community Services in Butler. Serving in the Air Force for 18 years , Jessica decided to end her service a year ago with high hopes for her future. Finding a job immediately out of service, Jessica was unemployed only four months later. As a result of financial struggles, the Watkins family car was repossessed leaving the family unsure of how to care for their son who suffers from asthma in an emergency and how she would see the rest of her family and three older children. With the receipt of this vehicle, Jessica will be able to see her children more often, care for her son and travel for special events and family trips throughout the year. The keys to the refurbished 2013 Ford Explorer were presented to Jessica and her family on Saturday May 16, 2015 at Randy & Bob’s CARSTAR 40th Anniversary Open House. “This whole experience is very humbling. All I heard before leaving the military is that veterans are not well taken care of, but this experience has proven that to be wrong. I am proud to be from a great supportive community that is caring for veterans,” said Jessica Watkins. The vehicle donation comes through MetLife Auto & Home ® who is a member of the National Auto Body Council and has been a Recycled Rides partner since 2009. “Through MetLife Auto & Home’s partnership with the Recycled Rides, we’ve been able to make a difference in many people’s lives by donating a car to those in need. It is an honor to be a part of another donation to help a veteran and to be part of an organization that gathers members from across the industry to work together for a good cause.” - Richard Ward, Director, MetLife Auto & Home. The Center for Community Resources in Butler sought nominations of families in need of reliable transportation, and Jessica was selected by them as the recipient. The mission of Center for Community Resources is to make a positive difference in every day lives by connecting people to a network of supports and services essential for actively learning, working and living in the community. The agency’s goal is to coordinate supportive services for individuals and families seeking information & referral for mental health, intellectual disabilities, substance abuse and other human service needs. Natalie Butcherine, Marketing Manager at Randy & Bob’s CARSTAR, stated everyone at Randy & Bob’s CARSTAR feels honored to use their resources and team up with the National Auto Body Council and MetLife Auto & Home to help this local veteran in need. The staff at Randy & Bob’s CARSTAR volunteered their time to repair the car and several local businesses also donated gas gift cards, oil change certificates, grocery gift cards and other items to help Jessica with her new vehicle. 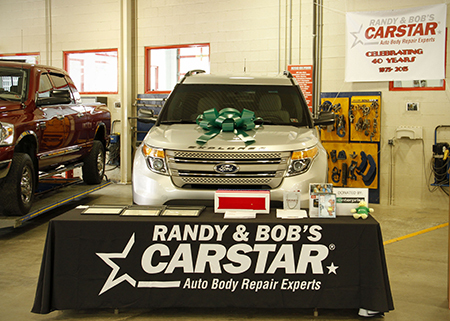 “Randy & Bob’s CARSTAR has been a member of the NABC for several years now. I want to thank the NABC for giving us the opportunity. I am overwhelmed by the generosity of everyone involved. Knowing that this vehicle will help her provide better for her family makes all the time and hard work everyone put into this completely worth it,” said Butcherine.